The undoubted highlight of the last 10 days involved an attempt to use the iPhone with the Polk Audio miDock Studio iPod speaker. About 30 seconds after we docked the iPhone into the miDock Studio, we heard a series of beeps, followed by a three-second screech (we assume this was TDMA noise). After we removed the iPhone, it wouldn't power on. A soft reset (hold the Sleep/Wake button and the Home button until the Apple logo appears) failed. We connected the iPhone to a Mac, and iTunes recognised the device. Using iTunes' Restore feature gave us back our iPhone. When we contacted Polk Audio , we were told that the iPhone needs to be switched to Flight Mode, which is done in the iPhone's Settings. For now, we plan to play it safe and only use accessories that have been confirmed for use with the iPhone. That doesn't necessarily mean sticking with accessories that have the Apple-approved "Works with iPhone" logo (which is an Apple-sponsored program that vendors must pay a fee for). It means look for exact wording on the product that states iPhone compatibility. Our major disappointment with the iPhone is with the 2-megapixel camera. We tried to challenge the camera's capabilities by varying the light conditions. We put the subjects in varying degrees of motion, and other situations, and the camera failed miserably. Our photos are marred with streaks, noise, blurriness, and colour shifts. The camera lacks any features - it's essentially a glorified iSight . About the only thing the camera is good for are well-lit portraits. Our skill with the touchscreen keyboard has developed nicely. We're roughly twice as fast as we were when we first got the iPhone, and we're taking full advantage of the predictive suggestions. We discovered one trick that makes typing full stops (".") more efficient. Press the . ?123 key, but don't lift your finger. When the punctuation keyboard comes up, drag your finger to the full stop, and then lift your finger. Not only is your full stop typed, but the iPhone switches back to the Qwerty keyboard. We've made and received a dozen calls, and all the calls were clear and didn't drop out suddenly. We even received a call as we were syncing the iPhone. We took the call on speakerphone, while still connected to the Mac. When the call finished, the sync continued without a hitch. The iPhone doesn't show any physical signs of abuse or wear. The glass screen remains scratchless, though we seem to wipe it clean at least five times a day. Our obsessive cleaning has nothing to do with smudges hindering the interface; in fact, you don't notice any smudges when you are using the iPhone. Put the iPhone to sleep, however, and you immediately notice the messy screen. 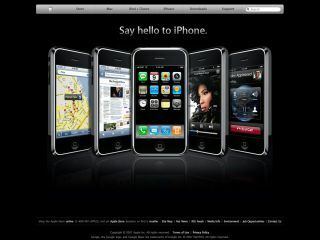 A lot has been said about the possible features of iPhone 2.0. But one feature we want to see in iPhone 1.1 is a setting that determines what screen opens when you launch an app. Currently, iPhone apps open to the last place you visited, which isn't always helpful or preferred. For example, Mail opens to the last email account you checked. So if you have multiple email accounts, you have to navigate back to the accounts page. We'd prefer that Mail open to the accounts page every time. Another example: Calendar opens to the date you last looked at. We want it to open to today's date all the time. And yet another example: Safari opens to the last Web site you visited. We'd like to be able to set a home page, or always open to a blank page. This is the only serious pet peeve we've found with the interface so far.